1. What is inclusive finance? Inclusive finance aims to increase access to low-cost and responsible financial services for vulnerable people, with the objective to tackle poverty and support economic empowerment. Inclusive finance includes a broad range of financial services and products, such as savings, microinsurance, microcredit, remittances. It targets mainly small entrepreneurs, and small and medium sized enterprises. 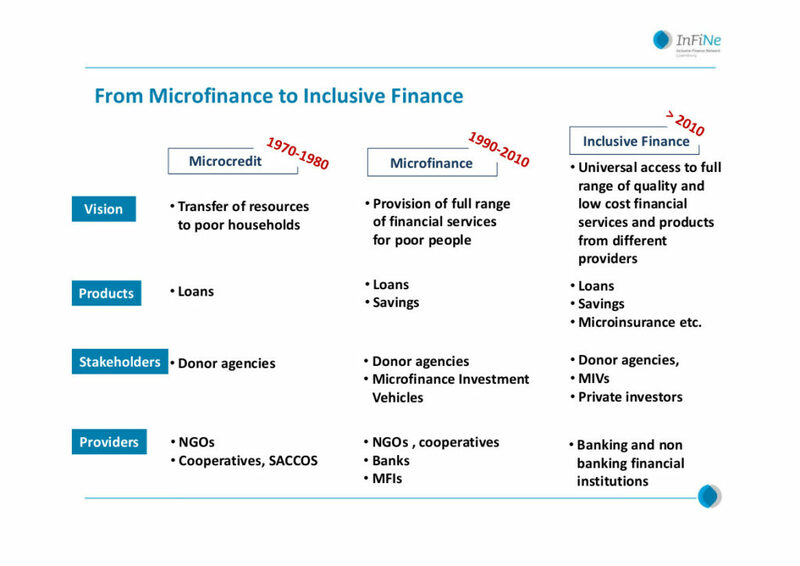 The notion of “inclusive finance” has its roots in the evolution of the concept of microfinance. In the70s and the 80s, NGOs based in the South started providing microcredit, i.e. small loans to people excluded from the financial system to engage in productive activities. During the 90s, the microcredit revolution showed that it is possible to serve poor families sustainably. It also demonstrated that poor households need access to more diversified financial products (insurances and savings). It is the spread of the word “microfinance”. In the last decade, the sector realised that the needs are even broader. Financial services, such as provision of financial literacy trainings, consumer protection, development of mobile technology, and financial products to reach SMEs are essential. Therefore, the international community decided to use the generic name “inclusive finance” . Microcredits are small loans to people excluded from the financial system to engage in productive activities. Microfinance is the provision of financial services and products, such as loans, savings, and insurances to poor and low income people. 5. What are Microfinance Institutions (MFIs) ? Microfinance Institutions (MFIs) are entities providing financial services and products (loans, deposits) to poor and low-income people. Clients of MFIs do not have access to traditional banks. MFIs are subject to specific banking regulation. 6. What are the Microfinance Investment Vehicles (MIVs)? Luxembourg is a leading jurisdiction for MIVs. Two-thirds of MIVs are domiciled in Western Europe, mainly in Luxembourg and the Netherlands. As of December 2015, Luxembourg funds accounted for 61% in the MIV market size. Today, Luxembourg accounts 39 MIVs. But what are the MIVs ? MIVs are investment funds dedicated to microfinance run by specialised managers using traditional expertise adapted to the needs of Microfinance Institutions (Source of the definition : MENDELSON, Sam, ROZAS, Daniel, Microfinance an Evolving Industry in Microfinance Banana Skins Reports, CSFI Center for the Study of Financial Innovation, 2014). 7. What does digital finance mean ? Digital finance is the delivery of Financial services through technological platforms, such as mobile banking. 8. What is the Global Partnership for Financial Inclusion (GPFI) ? The Global Partnership for Financial Inclusion (GPFI) is an inclusive platform for all G20 countries, interested non-G20 countries and relevant stakeholders to carry forward work on financial inclusion, including implementation of the G20 Financial Inclusion Action Plan, endorsed at the G20 Summit in Seoul.